Your Royal Highness..We Need Your Help! Prince William has launched a project to mark the Queen's diamond jubilee by saving hundreds of playing fields. The aim is to create or preserve 2,012 open spaces by 2012, the year the queen celebrates 60 years on the throne. The prince said he hoped the parks across the UK - to be named after his grandmother - would reflect her legacy. 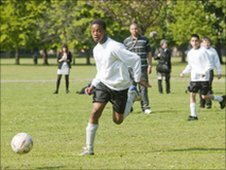 Fields in Trust, which is running the project, says a report from last month indicated that 6,000 playing fields have been lost since 1992. The prince said: "Playing fields are not a luxury. They are a vital component of any healthy and happy community.